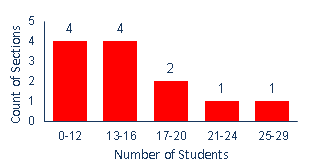 A Frequency Distribution is a summary of how often each value occurs by grouping values together. 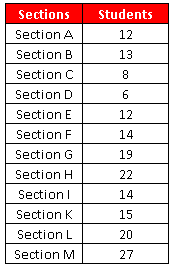 For example, you have data for class sections with the number of students in each section. There are multiple ways to calculate frequency distribution (table) with Excel. 1. 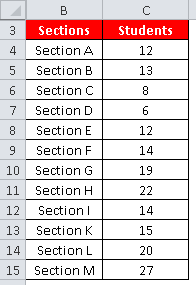 Enter the above data in cells B3:C15. The first row of table has headers. 3. Create a table with the columns - Class intervals, Lower limit, Upper limit and Frequency. Suppose class interval column starts from cell E5 (excluding header). Enter the following formula in cell F5 and paste it down till the last row of the table. Enter the following formula in cell G5 and paste it down till the last row of the table. Paste the formula down till cell F9. Make sure you enter double minus (--) before MID function. F5:F9 refers to bins of Upper Limit. We can prepare histogram using frequency table. 2. Click on the Insert tab and select 2-D Clustered Column. 1. Click on the chart. 2. Click the Layout tab under Chart Tools. 3. Click Axis Titles in the Labels group. 4. Select Primary Horizontal Axis Title and then select Title Below Axis. 5. Select Primary Vertical Axis Title and then select Title Below Axis. 3. On the Layout tab of the ribbon, click on the Axes button. 4. Select Primary Vertical Axis >> Select More Vertical Axis Options. 5. In the Axis Options section, for Minimum, select Fixed and enter the lowest number you want on your Y-axis. In this chart, i used 0. 6. For Maximum, select Fixed, and type the number where you want the Y-axis to end. In this chart, i used 5. 3 Responses to "Calculate Frequency Distribution in Excel "